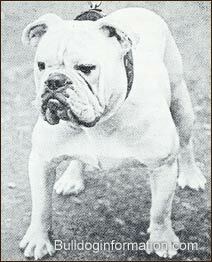 The ancestry of the Bulldog has long been subject to controversy among cynologists and naturalists. Buffon considered the Bulldog as the parent of the Mastiff, while Sydenham Edwards contended that the Bulldog resulted from crossbreeding the large Mastiff and the Pug. Still others suggest that both the Mastiff and the Bulldog had a common ancestor in the Alaunt. The Alaunt was defined in a dictionary of 1632 as being like a Mastiff and serving butchers to bring in fierce oxen to keep them in their stalls. Down through the centuries, until a comparatively recent time, the name "Mastiff" has been applied indiscriminately to all large or massive dogs. See also: alano history. The earliest English "book of dogs", written by Johannes Caius, of Cambridge, in 1576, does not specifically mention a bulldog, suggesting that the bulldog as a breed had not made its appearance yet. In his book, Dr. Caius described the "Mastive" or "Bandogge" as a vast, huge, stubborn, ugly and eager dog, of a heavy and burdenous body, serviceable to "bait and take the bull by the ear". He added that two dogs at most were sufficient for that purpose, however untamable the bull might be. The word Bandog was also used ambiguously and applied not to a distinct breed, but to all dogs that were usually kept chained up or in bonds. To make things even more complicated, ancient texts written by Roman historians described the fierce Greek, Molossian dogs and the "pugnace britannicii" or fighting dogs of Britain used in battles. These fighting dogs of Britain were known as the "broad-mouthed dogs of Britain", and according to R.H. Voss "there is very little doubt that they were the original and remote ancestors of our Mastiff and Bulldog. They appealed immensely to the Romans, who sent considerable numbers of them from Britain to Rome to take part in the sports of the amphitheater, and it has even been said that the Romans appointed an officer to select British dogs and export them to Rome." What most breed historians do agree on is that Bulldogs owe their name to the fact that they were once used to guard, control and bait bulls. The baiting of bulls before slaughtering them was based on the belief that if a beef were to be slaughtered, it should first be baited so that the meat would be more tender and nutritious. As a result, a butcher who sold the flesh of a bull that had not been baited, was liable to a penalty and the meat was considered unproper for consumption. Bull baiting was also considered a "sport" and enjoyed great popularity in the middle ages among noblemen and royalty. The Bulldog is clearly distinguished from the Mastiff for the first time in 1631 in a letter written from San Sebastian in Spain by an Englishman called Prestwich Eaton to his friend George Wellingham, then living in London, in which the word bulldog appears separately from the Mastiff when the author of the letter asks to be sent " a good Mastive dog, a case of liquor and I beg you to get for me some good bulldoggs". According to many bulldog historians this is considered definite proof that the Bulldog and the Mastiff were then becoming separate breeds. In those days, many crosses were made using Mastiffs and Bandogges, and outcrosing to various other breeds was also frequent. Eventually the size, shape, and color of the Bulldog became more recognizable, though. Most of the better breeding was done in the London, Birmingham, and Sheffield areas. A very graphic description of the Bulldog's qualities of that time, can be found in the 1800 Cynographia Britannica, by Sydenham Edwards. It describes the bulldog's "head round and full, muzzle short, ears small... chest wide, body round, with the limbs very muscular and strong; the tail... rarely erected (...) the the most striking character is the under-jaw almost uniforly projecting beyond the upper;(...)"
In 1900 Mr. John Proctor, and Englishman resident in Antwerp, who was a well-known dog fancier purchased an old bronze placque or medallion in Paris from Monsieur A. Provendier, a noted breeder of French Bulldogs. This antique bronze placque was dated 1625, and bore in bas-relief the head of a cropped Bulldog, and the inscription ``Dogue de Burgos España", the artist's name being Cazalla. The cropped dog depicted on an old Spanish plaque of 1625 depicting a Dogo de Burgos (Burgos Mastiff) was obviously a big dog quite similar to the Bulldog: much underhung, with a big skull and a well laid back nose. Many years later, in the year 1840, Bill George imported a Spanish Bulldog from Spain, which he called Big-headed Billy. In 1868 Mr. Macquart imported Bonhomme and Lisbon, and in 1873 Mr. Frank Adcock acquired Toro and Alphonse in Madrid. Spanish dogs were reasonably short in face, and had proper Bulldog tails, with a downward crook at the root and another at the end. All of these five specimens were termed pure-bred Spanish Bulldogs, and they were all exactly of the type depicted on the 1625 Burgos plaque. However, since the ears of all Spanish dogs were closely cropped there is no definite description of what their ears may have looked like. From this bronze plaque and from the fact that in the second half of the 19th century many famous bulldogs like Toro and Billy were imported from Spain, the late Mr. George R. Krehl, who was in 1900 the editor of "The Stock Keeper", built up a theory that the Bulldog originated in Spain. This theory can not hold for one moment. Indeed, the export of Bulldogs had been commenced well before, by Philip II in the 1500s, and from England TO Spain. Moreover, it has been shown that as early as 1154 the baiting of bulls and bears by dogs in England was a popular amusement, and many dog historians agree that these dogs were the descendents of the 'broad-mouthed dogs of Britain'. The fact that the ``pugnacious" of Britain were known as the ``broad-mouthed dogs of Britain" and that Claudius in 390 stated that they were able to pull down a bull, may indeed show that these dogs were, of course, in a rough and typical manner only, the original stock from which the Bulldog and Mastiff sprang. The Bulldog Information Library 2003-2011 © All rights reserved. In 1802, after a very heated discussion, a bill to abolish bull-baiting was issued at the House of Commons. The practice continued, however, until 1835 when it was made illegal by an Act of Parliament. With the decline of bull-baiting, the number of purebred Bulldogs began to diminish rapidly. The sport of dog-fighting, which succeeded bull-baiting in public fancy, was largely responsible for the diminishing number of pure-bred Bulldogs. 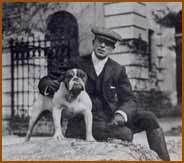 Many breeders began crossing the Bulldog with the Terrier because they felt that such a Bull-and-Terrier cross produced a better fighter. About this time, a number of laws were passed which placed restrictions and taxes on dogs; these, together with the fact that the Bulldog's chief uses were outlawed, all but completed his doom. Go on reading with the First Bulldog breed clubs.